An advertisement circulating on Facebook and Twitter for a desktop version of the photo-sharing application Instagram is a scam, according to security vendor Symantec. Instagram, which is owned by Facebook, is only available for mobile devices. Its popularity, however, makes it attractive for spammers and scammers, wrote Satnam Narang, a security response manager with Symantec, on Tuesday. 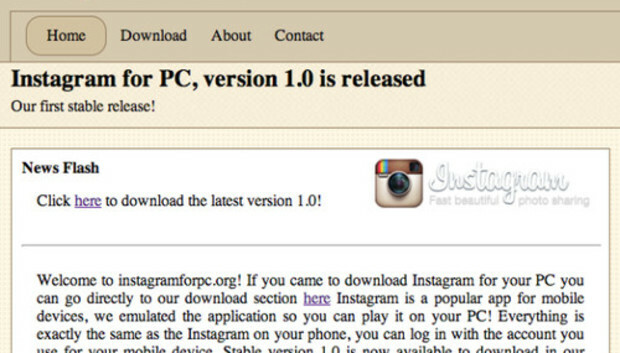 "Both of the supposed versions of Instagram for PC do not deliver as promised," Narang wrote. "This is just another vehicle for the scammers to convince users to fill out surveys, so they earn money through shady affiliate programs." Luckily, Narang wrote that "there was no malicious functionality bundled with the software, such as a keylogger or backdoor." Such ploys are typically wrapped up with malicious software. The scammers offer what is purportedly an emulator that allows Instagram to run on a desktop computer. Clicking on a link initiated two downloads, one of which is a large ".rar" compressed archive and the other a bundle of dynamic link library files, Narang wrote. Running the program launches a login screen. If a user logs in, an error message is displayed along with a dialog asking if the user wants to download another file that is supposedly needed. The program then implores people to "click a variety of social sharing options before trying the download again," Narang wrote. Finally, the user is lead to a survey. Another version of Instagram for PC asks the user to activate the program that then displays a pop-up window, which leads to another survey. The dodgy program has gained a bit of traction. Narang wrote more than 4,000 people have posted about the application on Twitter and Facebook. Another 2,000 have shared it on Google+.